Unlike most early light sport aircraft designs, the CGS Hawk was not born from a converted glider. It was designed in the early 80’s from the wheels up to be a proper little airplane. The goal was an enclosed cockpit with removable doors, three axis controls, actual wings struts in place of cable bracing, and a choice of steerable tricycle gear or conventional landing gear with a steerable tail wheel. The engineering phase of this design took over a year before any metal was cut. The engineering criteria used was that for conventional general aviation aircraft and is reflected in the airplane’s flight characteristics. In 1982 after years of design, fabrication and rigorous testing, the CGS Hawk was born. Our goal and mission is to preserve the CGS Hawk name and storied history. To stay true to an outstanding and multiple award-winning design and to provide timely support to the 2500+ of existing and future Hawk owners. Engineering: The CGS Hawk, unlike most early designs, was not a converted glider. It was designed from the wheels up to be a proper little airplane. The engineering phase of this design took over a year before any metal was cut. The engineering criteria used was that for conventional airplanes. Testing: CGS Aviation performed load tests of the control system and various control system methods. Landing gear drop tests were performed as well. Load testing of the wings in both positive and negative conditions, load testing of the horizontal and vertical tail assemblies for gust and positive and negative loadings verified the engineering data as to the strength of the airframe. Flight tests included stalls in all configurations, (with and without flaps), maximum gross weight takeoffs and landings, tuft testing, prop tests, maneuvers, spin attempts and high G maneuvers. We followed the normal guidelines for flight testing a new design. The first two Hawk prototypes had over 200 hours each before we sold the first hawk to a customer. Ease of Maintenance: The construction of the Hawk, utilizing aluminum anodized tubing and gussets held together with pop rivets, allows for easy repair, even in the field if necessary. For example, a bent tube can be removed by drilling out the rivets with a battery powered drill and installing the new tube using rivets and a hand operated pop riveting tool. The Hawk features completely anodized tubing which stops corrosion and allows for long life airframes. Many Hawks built in 1983 are still flying today. Pilot Protection and Safety: The first concern during the Hawk’s design was how to best protect the pilot during forced landings in trees, rough fields, barbed wire fences, buildings, or other unforeseen obstacles. The sturdy bridge-like structure of one inch diameter tubing, forms a roll-cage which surrounds the pilot completely. Combine this with the seat belt and shoulder harness restraint system and you have the ideal situation wherein the airframe takes the initial shock of impact instead of the pilot. THIS IS AN IMPORTANT BUFFER ZONE. Designs where the pilot is completely, or partially, hanging out of the airframe, can allow him or her (rather than the airframe) to take the first impact in an emergency situation. The shape of the nose serves a dual purpose of aerodynamic efficiency and pilot protection. In the event of a tree landing, or any landing where you might go through some type of irregular mass, this noe shape allows the branches, or other mass, to slide above and below the pilot, much like a wedge. 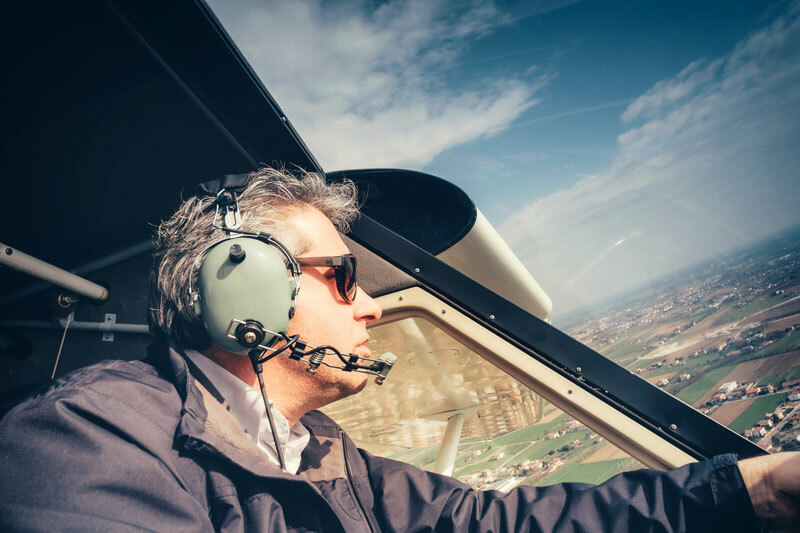 All these features for pilot protection can sound gloomy, but fortunately you will probably never need them. Like car insurance, however, it’s good to have it when you do need it. Performance & Features: The Hawk’s wide landing gear serves two functions. First, it allows for greater crosswind capabilities (20 knots, 90 degrees, tested). The wider gear also lets stones or gravel, (which can be kicked up by the tires and thrown backwards) not hit the propeller. In narrow landing gear designs, the prop disk is directly behind the tires, throwing stones into the prop. The large horizontal stabilizer area provides exceptional longitudinal stability and a broad CG range. The large vertical stabilizer and rudder also provide exceptional yaw stability. The Hawk maintains positive elevator control right through a stall. The curved boom tube serves many useful purposes. It allows the horizontal stabilizer to be mounted above the downwash of the wings and flaps, allowing you to slip the Hawk with the flaps down. It provides for the gear legs to be shorter, while still having enough clearance at the tail. Shorter gear legs also allow the vertical CG to be lower for enhanced ground stability and easy entrance and exit to the cockpit. And, it looks good too! The process of bending the boom tube work hardens it a bit, increasing its tensile strength. A curved tube is also torsionally stiffer than a straight tube. The kit itself comes with the wings, horizontal and vertical stabilizers, elevators, and flaps constructed, the welded parts complete and 51% for you, the builder, to pop rivet and assemble. The covering fits onto the wings and fuselage like a sock on a foot. History of experience supported by complete test records. Complete analysis by professional aeronautical engineers as to construction, engineering and materials. Experience with the new and improved CGS Hawk today! March, 1982 – Best New Design, Sun-n-Fun. August, 1982 – Outstanding new design, EAA Oshkosh. August, 1982 – Reserve Grand Champion, EAA Oshkosh. 1983, First Place overall DuPont Kevlar ARV Design Competition, out of 126 entrants, for design, engineering, flying, performance and portability. The Hawk received a perfect score of 20 in each category, except portability, where it scored a 19. 1992 – Fleet of 15 Hawks purchased by Peruvian Air Force for training program. 1995 – Reserve Grand Champion – Sun-n-Fun. 1999 – Hawk designer honored as one of the first 3 inductees into EAA Ultralight Hall of Fame. 1999 – Hawk Sport – 1st place winner of World Air Games Competition. 2001 – Hawk Sport – 1st and 2nd place winner of World Air Games Competition. 2002 – Hawk Sport – 1st place Fuel Endurance. 2003 – Hawk Sport – 3rd Place World Microlight Championships – England. 2003 – Hawk Arrow II – Best Construction Kit – Sun-n-Fun. 2003 – Hawk Classic/Sport – Best Classic Ultralight – Sun-n-Fun. 2004 – Hawk Arrow II – Best Ultralight Trainer – Sun-n-Fun. 2004 – Hawk Sport – Outstanding Fixed Wing Ultralight – Sun-n-Fun. 2005 – Hawk Arrow II – Outstanding Fixed Wing Ultralight – Sun-n-Fun. 2005 – Hawk Sport – 1st Place Wig Wag Competition. 2006 – Hawk Arrow II – Best Type Construction Kit Ultralight – Sun-n-Fun. 2006 – Hawk Sport – 1st Place US Microlight Championships. 2008 – Hawk Arrow II – Reserve Grand Champion Light Sport Aircraft – Sun-n-Fun. 2009 – Hawk Arrow II – Grand Champion Light Sport Aircraft – Sun-n-Fun. 2010 – Hawk Ultra – Reserve Grand Champion Ultralight – Sun-n-Fun. Want to chat with the CGS Hawk experts?